August 08 - Our return to Britain after our visit to San Francisco gave us the immediate impact of jet lag when we returned to work. The summer weather continued in the same vein as the previous months with wet and windy days being the norm. As always we made the most of our spare time. Looking back at last August there is a noticeable difference in our activities - click here for what we were doing a year ago. We received a visit from Clive and Tricia in the first week of the month. Steve picked them up from Heathrow and we gave them an opportunity to get over their jet-lag in the comfort of our home. Tricia hadn't visited the UK since her student days and then only London which must have given a very narrow view of Britain. As we travelled up the M40 through the Oxfordshire countryside she was surprised how green it was with so many fields and so few buildings. No comment was made on our quiet, village residence or our Northamptonshire stone house. 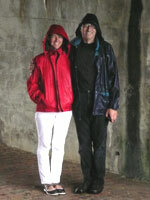 We went for a walk around Stoke Bruerne and although it was very wet it didn't dampen our enthusiasm as can be seen from this photo of the happy couple standing beneath a bridge. Steve also took them into Northampton and they had a tour of the Charles Renee Macintosh house, 78 Derngate, whilst Steve went off for some treatment at the dentist. Their visit was soon over and on the Saturday morning we whisked them off to Luton airport for a flight to Edinburgh where they had rented a property to stay in whilst enjoying the Edinburgh Festival. We had hoped to join them but unfortunately Steve just had too much work on to spare the time. In a year with such poor weather for ballooning we did not have high expectations of the Northampton Balloon Festival being any different and the long range forecasts all indicated some wet and windy conditions. The Friday morning was kind to us with blue skies and light winds on the surface although the rain during the previous week meant that the festival ground on the Northampton Racecourse park was very muddy. They were not allowing any balloons into the main arena but they only made that decision after we'd driven on and unloaded the balloon so went ahead and inflated. Steve did the inflation and conditions were very good even though there was a fast (18 knot) low level jet (wind) at about 400 feet, above this and below it the winds were about 5 knots, quite acceptable for the landing. Nick did the final landing on some fallow ground and he kept the balloon inflated until the crew had sight of us and they had permission to collect us from the field. 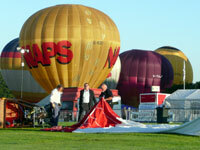 The only drawback was that we had to drive around the edge of a ploughed field to get to the balloon. Jane was nervous that the Honda would get stuck in the plough so Steve took controls and made a run at it. The Honda proved to be a true 4x4 and crossed the mud without any problems. Within a short space of time we were back at the Festival site, refuelled and sitting in the food tent tucking into sausage and mushroom baps, plenty of brown sauce, and a mug of tea - heaven. Nobody else stayed for breakfast and it was noticeable that the old camaraderie amongst the old ballooning business crew was never going to be the same. Time and people move on. Friday evening proved to be the last flying slot for us. We arrived on the field later than we had hoped to find that all the best areas had been taken and we had to squeeze ourselves between some others, one of which was a large rides balloon. The pilot's briefing indicated that the winds were a little on the high side and gusty but were forecast to die down. We decided to play a waiting game watched as others inflated with difficulty. After 45 minutes of waiting we decided to "give it a go". 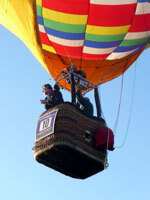 Nick got the balloon ready to go and with a final blast we let go and were away heading north towards Kettering. Up at 1,000 feet we had a steady 12 knots which wasn't dramatic. Half way through the flight Steve took control and the sun was getting lower in the sky as he made his way over some large power cables - large in the sense they were part of the national grid and therefore tall but also large for the voltage they were carrying - all this in fading light - scary. In the final approach we were 50 feet above the ground and still travelling at 10 knots, quite quick for the unpractised pilot. After brushing the side of a tree we made a successful landing (they walked away from it) in a grass field. The crew (Jane and Val) were in the vicinity of the landing but had some troubles finding a landowner and how to get onto the field. Eventually we got back to the site, refuelled and off to bed in case we were to be up very early and flying the following morning. As expected Saturday morning and evening were blown out. We awoke at 03:00 on Sunday morning to here it pouring rain. It was still raining at 04:30 when Steve got up, rang Nick and they agreed to not bother going to the launch site. As it turned out the rain did stop in time for a few balloons to risk the wet fields and fly. The last Saturday of the month saw us rising before dawn for our fourth flight of the year - this time last year we had flown twelve times. Steve did some very low flying as can be seen from this photo. 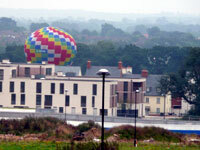 At this point he was flying over the park area in front of the houses on the new Upton One estate. The cloud was quite low and there was little prospect of a blue sky but it was good to be out especially we had the delights of giving Dave Kew a flight. A bit of a busman's holiday for him seeing as he flies nearly every day in the Kenyan Masai Mara. He could relax on this occasion and leave the concentration to Steve and Nick. We flew West towards Flore. There were plenty of harvested fields to choose from and Nick eventually landed just east of the Brockhall estate. Great field close to the road and no farmer problems. This flight ran to a timetable: We took off at 06:55; landed at 07:55; refuelled and were in the Super sausage for breakfast at 08:55 - perfect timing. As we approach September so we've decided to enter the Cycle4Cynthia charity cycle. 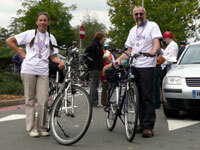 As always Jane wants to cycle the 50 mile circuit and Steve only feels fit enough to do the 25 miles. To make sure we're both going to make it we started practising with a first effort of 16 miles the last 4 miles in the rain so we arrived home very wet. This picture was taken at the end of last year's event. More of this next month but if you wish to sponsor us please let us know.